Maybe cooking talent and parenting skills do not necessarily always go hand-in-hand. But in these days of the Food Network and numerous reality shows based around creating the perfect dish, cooking together at home is becoming a popular way for families to bond. And whether you are single parenting or sharing the joy with a partner, chances are your kids will love to spend some time with you in the kitchen, cooking up a fun treat. Wondering where to start? 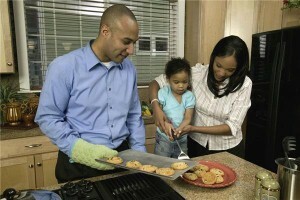 When bringing children into the kitchen for the first time, presenting a brief safety demo is a smart use of your parenting skills. Simply remind them about the importance of washing their hands, being careful with knives, steering clear of hot burners and turning everything off when they are finished. What to cook? Pizza is one option that can please the entire family. Make your own dough from a recipe or purchase a premade crust, then layer tomato sauce, veggies, pepperoni and mozzarella. Kids may also want to experiment with some unusual toppings they find in the fridge. If so, you may want to make a bunch of mini-pizzas in case some experiments wind up less successful than others. A fun activity for weekends that can also make you popular with your wife is to team up with the kids to cook breakfast in bed for mom. Think omelets (kids love to crack and whisk eggs) or pancakes. Cookies can be a good starter activity for kids who are too young to do much beyond stir batter. Let kids get creative with the dough and make funny or unusual shapes. Bonding in the kitchen can be a great way to apply your parenting skills so that everyone learns and has fun – plus, you get to sit down with the little ones to enjoy the results.